The name Grand Prix has become a brand of its own in cycling circles worldwide. The Grand Prix is THE classic tyre marking quality and performance. Not unlike its predecessor, this generation is eager to change traditional standards. With a higher sidewall profile (height) than the GP4000S, the Grand Prix focusses on comfort and reliability, ideal for long, but fast days in the saddle. Inexpensive and relatively light tyre with very decent rolling resistance. The clever way to get really quite close to a GP4000. Great price, easy to mount, light and performance-oriented. I keep coming back to Conti GP as they are a quality tyre. Highly recommended. Great tire. Have no flat problems with these tires. And the rolling resistance is great for the amount of flat protection. Wow these grip. I'm not a confident downhill rider, but with these offering a crazy amount of grip, I have the confidence to take some of my regular downhills just that little bit faster and into the corners without hovering on the brakes. This is a good tire. The rubber has a great grippy feel to it. Gives me confidence while descending and cornering. They were a little bit difficult to fit onto my Fulcrum Racing 5 LGs. 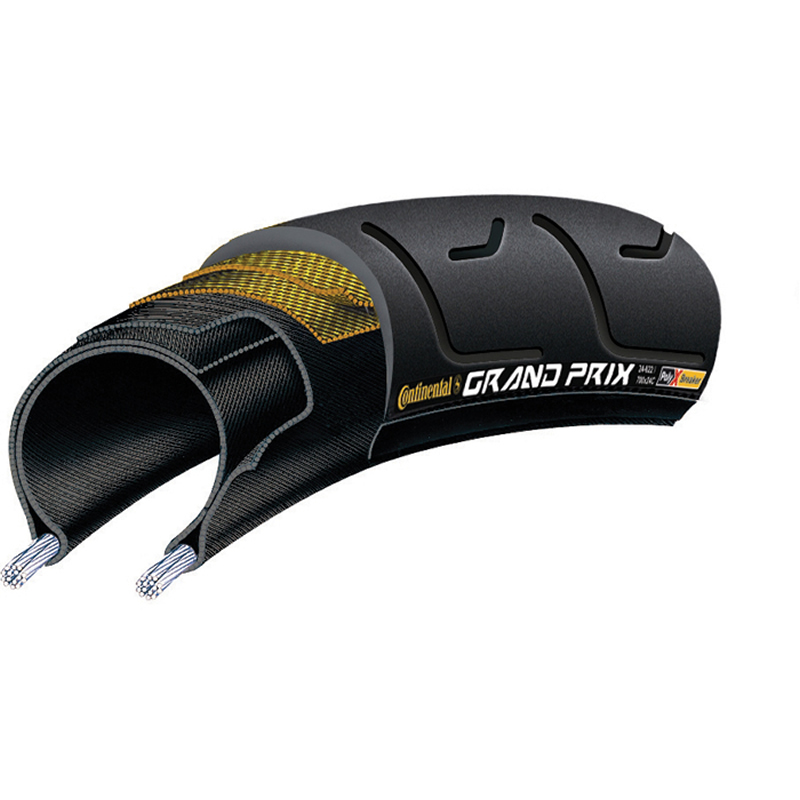 The first generation GP tyres from Continental, still a classic. Rolls well and a few pounds off the GP4000 model. Nice ride, good dependable grip. Light, grippy and great for sportif racing as well as weekend group rides. Great price on a solid tire sporting some of the latest tech from Continental! Roads in my area are horrendous and these tires are good at smoothing things out and hold up well. Great service from Merlin. Tyres are, on first impression, quick and afford good all round grip in English spring conditions (in rain showers). Great tyre for the price, superb grip and quality and no punctures so far, and as alway's excellent service from Merlin. These are excellent tires. They are a great balance of low weight, good puncture protection and low rolling resistance. They also give a really nice ride and grip well in the wet. Very happy shopping experience, is the second time to buy this tire, good performance, very satisfied. Excellent tyres - always use these - easy to fit and pretty good in wet conditions as well as dry. Excellent product, excellent wet grip. Fast rolling and very comfortable at 90psi. Higher pressures lowers the rolling resistance but at the expense of comfort. Worth noting that the extra comfort/ability to run at lower pressures comes from the 28c height profile of the tyre. So whilst marketed as a 25c width tyre, the height/circumference matches that of the true 28c on my other bike. These tyres represent good value and I would choose them over the more expensive GP4000S, as the extra comfort and puncture resistance more than makes up for the slight loss in rolling resistance. Bought these tyres for an upgrade on some stock wheels as I have used the GP 4000's and found them fantastic. These tyres are really grippy with the black chilli compound, but they do wear a lot quicker, I've only done 500miles and can start to see the wear, unlike the GP 4000's which seem to last forever. Anther gripe is the side wall on these tyre's, it really thin. I ended up going through one of the UK's many potholes and the rear tyre sidewall has suffered a large amount of damage, not very reassuring. All in all not a bad tyre, but I would spend the extra and go for the higher end GP tyres. Terrific tires (sorry, Yank spelling! )at a great price. Have tried most major brands over the years, and Michelin and Conti are my favorites, with the nod going to Conti w/Black Chili. I ordered these to replace the standard tyres that come on the Merlin PR7 road bike. They are really good tyres. I use my bike for commuting and training and have found the tyre performs really well. I have ridden in both really wet and dry conditions and they haven't let me down at all. I run them at 110psi and find they roll well and offer comfort too. I would recommend these tyres. Usual Continental quality, decent weight, rides well, what's not to like? Great tyres, really durable and grippy!! Value for money!! A great tyre at an fantastic price! They roll very well and the 24c provide a smooth, comfortable ride! Keen price here for a good product, which I bought on the recommendation of a well-informed friend. I was partly prompted by a piece in 'Cyclist' about the optimum qualities of a 24mm tyre. Be nice if the manufacturers produced 24mm in a few more colourways. Delivered the day after my order too. Great price for a great tyre. Last for ages, offer good grip, comfortable in use and reasonable puncture protection. Good tyre, not had a puncture as yet and the grip seems very good on wet and dry roads. All in all a good all round tyre, not as fast as some skinny race tyres. I'm really Chuffed with these tyres! I've been out on three 75+ mile rides this Jan/Feb on cold, wet, gritty & sometimes icy roads- No punctures, no wheelslip out of the saddle on steep hills. Good grip through fast corners. Second pair of Grand Prix tyres purchased from Merlin. Great combination of speed, grip and puncture resistance. The usual outstanding service and pricing from Merlin. Realy light, strong, and durable. I used last for 4000km without any flat. I have not done 100s of miles on these tyres yet so cannot comment on longevety. They do have a very responsive feel to them. Fit wise they are very similar to 23mm, i was worried they would catch my crudcatcher mudguards as there is very little clearance however after replacing 23mm tyre with these there was no requirement to adjust clearances. Altogether pleased with these. First few rides suggest the tyre matches the hype - fast with no punctures. Outstanding service and delivery from Merlin. My favourite tyre, a brilliant all rounder. I use these mainly on the winter bike, as they provide a great balance of robustness, longevity and weight. A little more comfortable than most 23's, but not so large as to cause issues with clearance on my mudguards or look out of place on the summer bike. Outstanding tires. Fast rolling, very durable, comfortable and at a great price from Merlin. Premium tyres at a bargain price, whats not to like? Great compromise for winter riding, not too thin, not too fat, perfect. Used conti's for years with never any problems, Good puncture resistance, wet performance good, reasonably light. They stand up to hampshire's lanes( mud laden, pot holed excuses for roads) well and last 2-3000miles. At special deal price a bargain. Super quick delivery- tyres are thinner than expected- more like 23c- yet to test them in the rain, but so far so good. Awesome price, Fast & free delivery! Many thanks MerlinCycles, you got my vote. Great tyres from the ultra reliable Continental tyre maker. Good and grippy, with just the right balance between weight and puncture resistance. Ideal tyre for my winter bike. Delivery by Merlin, post free (please take note other online bike shops!! ), was very quick given it was during the run up to Xmas. And the price! What can I say.